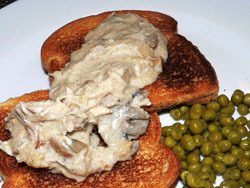 With this creamed chicken recipe, you have the base to made so many different chicken recipes. Just a few suggestion are to add some chopped up vegetables and put into a crust for chicken pot pie recipe. Another is to add some ricotta and Parmesan cheese to the creamed chicken and serve over flat egg noodles for a delicious Chicken Alfredo recipe. I don't know about you but after having a big Thanksgiving Dinner, I look forward to making some easy meals with the leftovers and these are some of my favorites. In medium fry pan, saute onion, stir in garlic and mushrooms and saute another 2 minutes to heat through. Set aside. In a one quart pot, melt butter. Stir in flour and cook until bubbly. Add milk, salt, pepper and celery salt. Continue to stir till it thickens. Add chicken and onion mixture to pot. Heat through, then stir in the sour cream. Serve over toast or toasted hard roll.